Next week we move into the remaining days of November and staff and students alike can see the finishing line in what has been a busy term. As we move towards the end of the year there is much to look forward to. This includes the Light Entertainment House performances, Christmas Cup and the Swimming Carnival. These whole school experiences help create a sense of belonging and build community. As this newsletter goes live today, the School and Boarding Captains and Vice Captains will be in Melbourne and Ballarat. They will be participating in the annual Loreto Schools Student Leadership conference over three days. 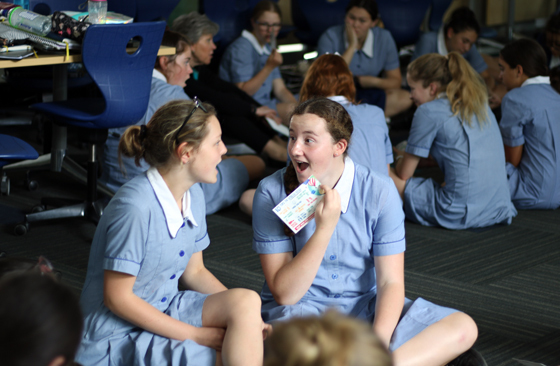 This conference brings together Loreto senior student leaders from Loreto schools around Australia in the spirit of Mary Ward’s open circle. It is a time of fellowship, discernment on leadership within the Loreto context and to write the Justice prayer for 2018. You will hear more from the Captains about the conference in next week’s newsletter. I encourage all our families to give to the St Vincent de Paul’s Christmas hampers. We are a generous community and any donation to the hampers will be gratefully received by the many families who will receive a hamper for Christmas. What has been one of your achievements in 2017? How are your friendships going? If there is conflict, have you mended the friendship? How has your understanding of the value of Freedom altered? What ways have you helped others this year? What will be your legacy in 2017?